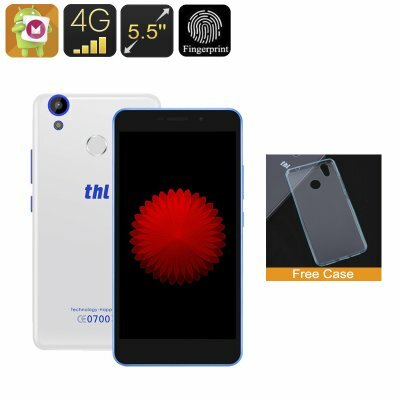 Successfully Added THL T9 Smartphone - Android 6.0, 5.5 Inch HD Display, Dual-SIM, 4G, Quad-Core CPU, Mali-T720 GPU, 3000mAh (White) to your Shopping Cart. Play games and enjoy movies to their fullest on the THL T9 Smartphone. Featuring a 5.5 inch HD display this budget smartphone offers a marvelous visual experience similar to the ones provided by high-end Smartphones. With its Android 6 Operating system and Google Play pre-installed on each device the THL T9 smartphone opens up a world of mobile entertainment. Download millions of free Apps, games, movies, and more. With this Chinese smartphone you are guaranteed to enjoy all the latest entertainment the mobile world has to offer in mesmerizing detail. Packing a MTK6737 Quad Core CPU clocked at 1.2GHz, a Mali-T720 GPU, and 1GB of RAM the THL T9 Smartphone packs some sweet hardware. It has a generous memory for running multiple applications simultaneously and playing the latest graphic-intensive games without any delay. Along with its 3000mAh battery this smartphone offers you up to 10 hours of continuous usage time to enjoy all our favorite Apps and movies, or to simply browse the web without the fear of running out of juice any time soon. Holding two SIM card slots and featuring two IMEI numbers this budget smartphone allows you to be connected on two different phone numbers and networks simultaneously while using just one device. This offers you the perfect platform to combine both your private and business contacts into one device. With its 4G connectivity you furthermore can be assured to have the fastest data speeds available at your disposal, ensuring that you will always be connected and never are out of reach for your loved ones and colleagues. With its beautiful and sleek design the THL T9 smartphone is the perfect device for anybody who is looking for a budget smartphone that offers a high performance. Watching HD movies, playing the latest games, and browsing the web for hours in a row, this Chinese budget smartphone is guaranteed to deliver an outstanding performance and comes with a surprisingly low price tag. The THL T9 comes with a 12 months warranty, brought to you by the leader in budget smartphones as well as wholesale electronic gadgets..